The expanse of rain-drenched green paddy fields which turn a golden hue in subsequent months, could easily belie how tough life was for people living in Kanakpur, a small village in Chhattisgarh’s Kanker district. The villagers, predominantly Gond Tribals, practised mono-cropping, with a skewed preference for paddy cultivation with nearly 70 percent of the available agricultural land used for this. The local production of pulses, oil seeds and vegetables was negligible, which had a negative impact on the nutrition of the villagers. Then there were the other challenges common across India’s rural landscape – poor socio-economic status of women, alcohol addiction among the men which often led to domestic abuse and aggravated the financial strain on the households, and lack of cooperation among the villagers to address common problems. Sensing the need for an immediate change in the order of things, the Chhattisgarh Gramin Ajivika Samvardhan Samiti (BIHAN), a registered society which has been entrusted to implement national rural livelihoods mission in Chhattisgarh, stepped up. After multiple rounds of conversations with villagers on how best to address some of these challenges, it was decided that a Self Help Group (SHG) would be the best bet to bring in holistic and sustainable development at the village level. SHGs have proved to be effective catalysts of social change in a number of narratives across the country. However, the other side of the coin is that there have been times when SHGs have been ineffective and disinterested. So initially, the women who came together to form the SHG in Kanakpur had experience of the latter, weren’t convinced about its efficacy to help transform their village. That thought was soon to change, when BIHAN went on a visit to a neighboring village, a little more than 14 kms away. They saw how the local SHGs there were growing vegetables which not only brought in some income but also helped to bridge the nutritional gap. After returning to Kanakpur, the SHG members leased a plot of land, and began growing vegetables. After using the produce for home consumption, they sold the remaining and earned Rs 3,000 a month. Buoyed by this experience, they branched out into making organic manure and pesticides, to experimenting with various layouts for water drainage, and growing leafy vegetables. There was a distinct sense of collective involvement. Their early success notwithstanding, there were still other challenges. With summer approaching, the handpump which they used to irrigate their plot of land was not sufficient to meet their needs. So they bought water from a nearby borewell in exchange for harvesting an acre of land for the owner of the borewell. From weeding the land to levelling it, the exchange proved to be a profitable way to address the issue of water scarcity, without them having to spend money. However, the SHG group realised that the exchange of labour for water was only a temporary respite and were keen to find a more sustainable solution. And, on another exposure visit to Chhindbarhi, a village in Nagari Block, the SHG of Kanakpura found the answer – water harvesting. The women decided to first work on small farm ponds, locally known as Dabri. Across Chhattisgarh, these farm ponds were mostly used for bathing and fishing, and were hardly used for agriculture. But BIHAN’s intervention demonstrated how the water from the dabri was a great solution to irrigate the land. Usually, influential village folk used their social clout to get the land levelling and construction of a farm pond sanctioned by the sarpanch. But the BIHAN changed this, by introducing Integrated Natural Resource Management (INRM) based planning, and linked it to a revenue map and a social map to ensure that families who needed the water the most were given priority. And, the task for planning and execution was given to the SHGs. The women’s collective shouldered the entire responsibility – from selection of the patch of land, monitoring, measurement to payment. While earlier the village would see the construction of two to three farm ponds, the number increased to 18 in 2015-16, with most being a result of collective effort. 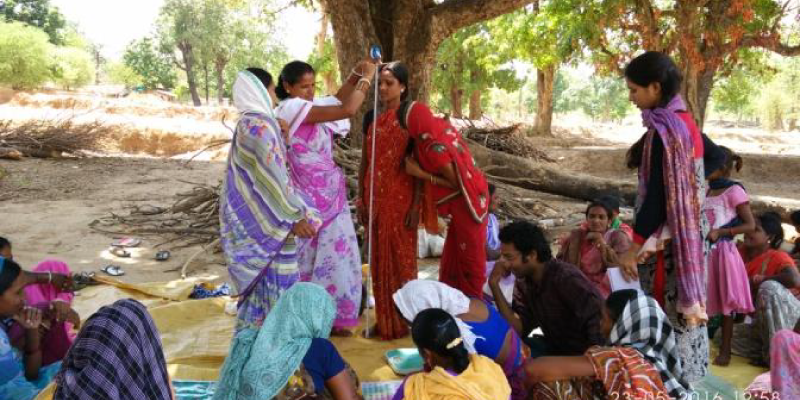 While the women grew and harvested vegetables in the leased plot of land, the BIHAN and SHG knew they needed to work towards a more comprehensive and holistic action plan to address the issue of malnutrition in the village. That’s when they introduced changes in the agricultural practices. Adopting the SRImethod saw farmers drawing a yield of 15 to 18 quintal per acre with just 2 kg of seeds. Further, usage of organic manure meant they saved money that would have otherwise been spent on chemical fertilisers. Also, numerous families in the village adopted nutrition sensitive agriculture, which meant they were cultivating leafy vegetables, tubers and creepers along with paddy, maize and pulses. Hence, families had easy access to a well-balanced nutritive meal with home-grown produce. The confidence that they could now address challenges through collective strength saw the women tackling the problem of alcohol addiction among the village men. They realised the problem was that liquor was being sold at the Panchayat market place in Asulkhar, a few kilometers away from Kanakpur. To shut down the sale of liquor the women needed support of the SHGs from nearby hamlets which belonged to the Panchayat. Cycling more than 30 kms in the scorching sun to reach out to the Federadation of SHGs, they were successful in bringing together the SHGs to become one strong team and work towards banning the sale of liquor. And, with persistent effort, the women succeeded in closing the liquor shop at the Panchayat. Having brought in transformation in agriculture, water usage practices and also putting end to persistent social evils like alcohol addiction, the Ekta Gram Sangathan, Asulkhar, a women federation which comprised eight SHGs from Kanakpur and Chichmarra village, divided themselves into four sub-committees. The objective of these sub-committees — Ajivika Samiti, Haq aur Adhikaar Samiti, Samuh Sudhaar Samiti and Samaaj Sudhaar Samiti – was to bring about overall development in the village. The Ajivika Samiti has taken charge to ensure the overall livelihood development of all the families, Haq aur Adhikkar Samiti is looking after the MGNREGA implementation in the villages alongwith monitoring the schools and anganwadis, Samuh SudhaarSamiti is helping new SHGs adopt the norms and get access to Revolving Funds and Bank Linkage available through NRLM, and the Samaaj Sudhaar committee is raising its voice against the violence on women. 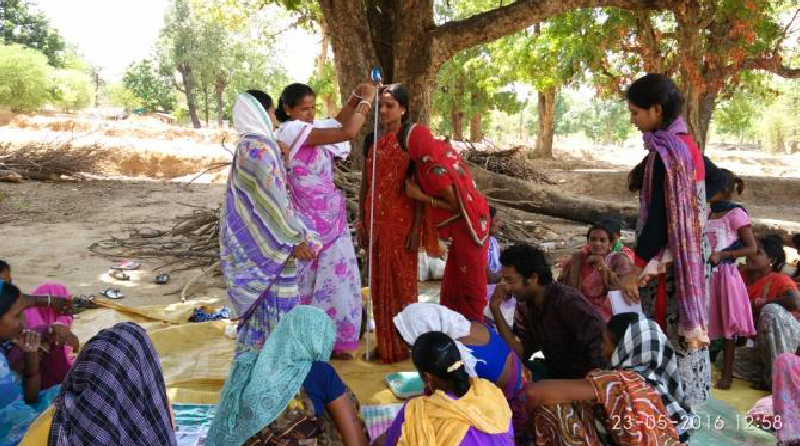 This is the story of how empowering a group of rural women not only helped address developmental challenges, but also herald holistic development of the village through a self-sustaining model.